…wins me as a new fan! I became aware of Mike Duke not through his books (how come?! ), but through a common book highlight: The City (S.C. Mendes – The City; Blood Bound Books; 2017). An author who seems to have the same reading-taste like me, makes me curious, of course. Again and again I’d like to buy one of his books and again and again I rejected this intent – up to Hate Inexorable. Actually, it was a kind of final chance I gave him: if he’ll convince me with a novelette with just 89 pages, whose theme and plot annoys me collossally, I would also give his other books (especially Low) a chance. Well – as already said: he convinced me…! Of course the first thought is of an enormous compression, when holding a novelette with just 89 pages in my hands – but the opposite awaits the reader here; Duke didn’t compress the story, but concentrated it – the relentless extract that engraves into the reader’s brain: please – thanks – in your face! As trivial, finally almost kitschy, as the beginning of the story spreads out in my mind’s eye, as hard the change of tempo punchs in my gut – you could think of Ryan C. Thomas‘ The Summer I died (Coscom Entertainment, 2009). This is not just a bursting bubble – here explodes the whole f*cking head! I don’t hold pages, but claw myself into the open flesh of fear, don’t read words, but follow the arrival of the four horsemen – do not follow, but be persecuted, be hunted, become a witness, become a desecrator – I am destiny! fans of Tim Millers violent excesses, Wrath James Whites character portrayals or Angel Geliques conscious crossing of borders should feel comfortable here. 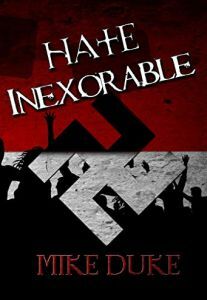 What makes Hate Inexorable so repulsive (isn’t it strange to use such a word as praise?) is not the exaggerated depiction of violence, but the realistic reproduction of violence: this hell is not born of the mud of fiction, but has risen from the vomit of our society. I particularly like the message that Hate Inexorable conveys: extremism and violence, no matter if from the left or right side, is and remains wrong! But instead of the indexfinger of admonition, the fist of reality waits here!